When I first started riding, I didn’t know any other riders in Los Angeles. Too be fair, I didn’t necessarily pick up riding because I wanted to be apart of a group. I started because I wanted to navigate the city faster, and not bleed out financially doing so. However, after a while of riding alone, I was invited out on a ride by a co-worker. It changed my mind about riding with other people. My first ride out with a group was more fun than I thought it would be. I also felt a little safer riding in a group than I had riding by myself. Cars tended to be much more aware of the riders as well when the numbers are up. At first I thought if I joined a motorcycle club, I’d have to pay these extravagant fees. Plus I didn’t have a great deal of free time to offer. A small part of me envied riders in clubs, because it always looked like they were having the time of their lives riding with each other. Plus, the cool jackets; I can’t forget about those. Although, I still haven’t joined a club, I’ve managed to build my own small community of riding friends. It was a lot easier than I imagined at first. A lot of times I’ll run into riders out and about, and they’ll just invite me to go on a ride with them. 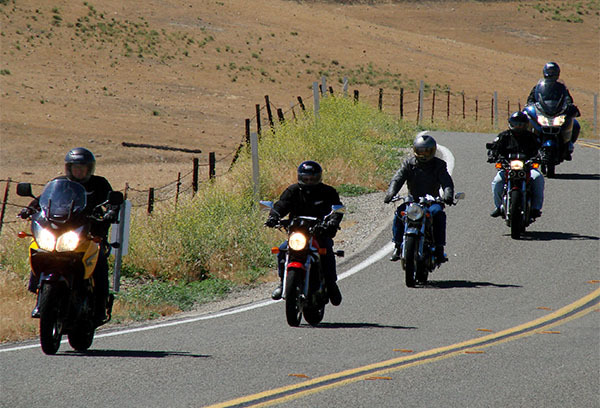 Then, I end up meeting a few more of their friends, and before I know it, I’ve got a new group of riders to go on journeys with. Finding a riding friend is very reminiscent of making a new friend in kindergarten. You find a toy you both mutually like, and you’re bonded as you play. Everything else you find out about each other is just a unique bonus. I can honestly say I’ve yet to meet a rider who’s been rude, or unfriendly towards me. Even the most physically intimidating riders have turned out to be extremely cool. So, I encourage everyone to chat up a rider they’ve seen around. Exchange contact information, and go on a ride. Some of the most interesting people I’ve met have been on the road. Stay safe in these streets!